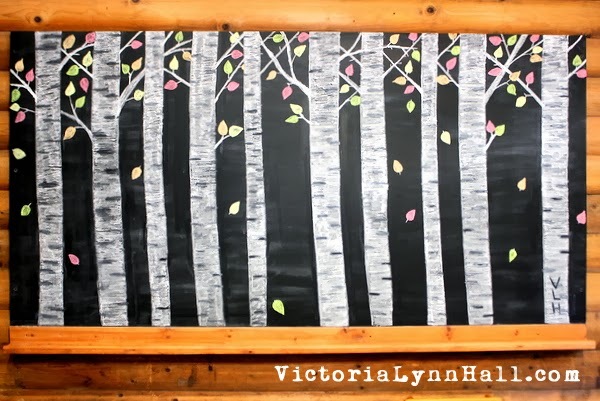 The current chalkboard mural in my living room allows me to enjoy some autumn foliage when I'm inside. The only formal art training I can claim is a drawing class I took for part of a semester when I was around twelve years old. I remember being very excited about my first assignment. I worked really hard on my drawing and was really proud to turn it into the teacher. Imagine my shock and disappointment when I learned the grade I received on it was a D.
I wish I had that drawing now but I threw it away and didn't tell a soul about it. Instead I silently observed everything that happened in class and figured out that the teacher only gave the As out to the meticulous students who could draw straight lines without a ruler (and no extra credit for creativity). I was able to conform to these standards enough to get a passing grade but I no longer enjoyed the class and by the end of it I had decided that drawing just wasn't for me. Of course I eventually grew up and realized that I don't need anyone's grade of approval to do the things I enjoy. 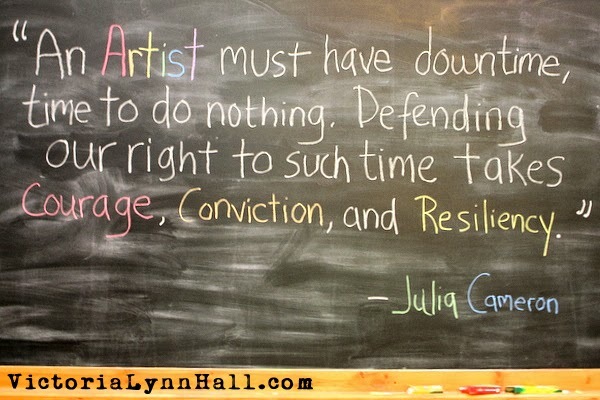 I learned to create art my way and not to worry about conforming to someone else's standards or expectations. Still, I have always been just a little more comfortable holding a painting utensil than I am holding a drawing utensil. This fact made facing a chalkboard the size of a small billboard a little daunting at first but it has proved to be a really good challenge for me. It has made me, both literally and figuratively, reach a little higher and dream a little bigger than I may have otherwise. So here's a look back at my first year of chalkboard murals. I'm giving every one of them an A+ for being some of the best art teachers I have ever had. 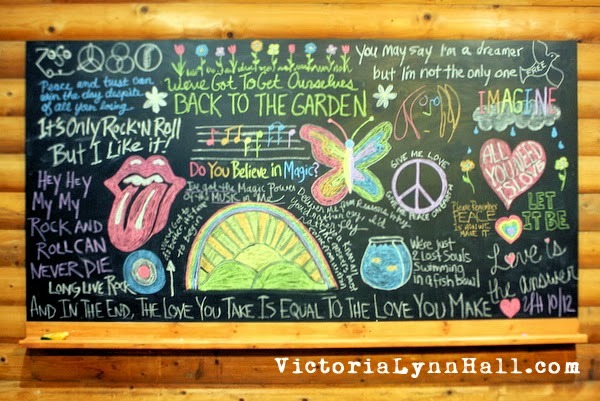 My first chalkboard mural was a celebration of Classic Rock. 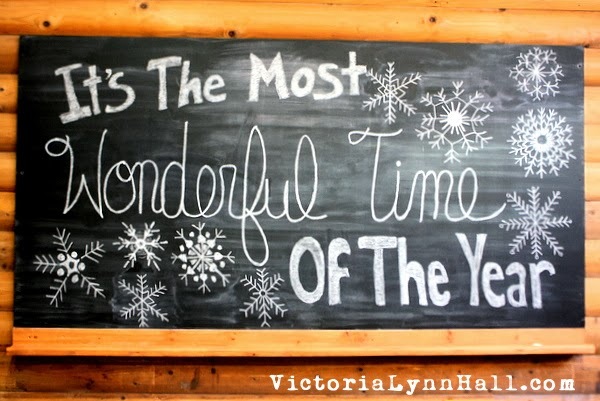 I managed to find a little time each day to draw a snowflake or two for this winter holiday chalkboard mural. 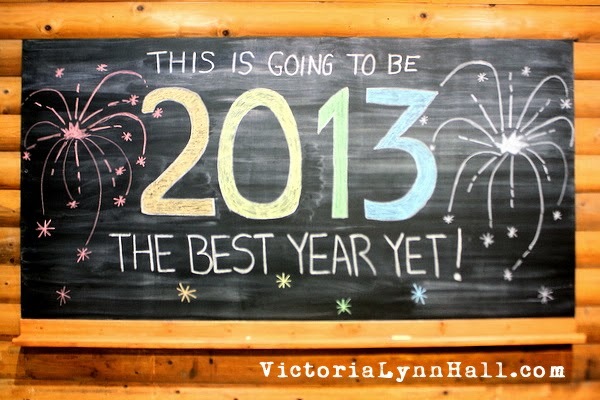 So far the prediction of this New Year's Eve chalkboard mural is holding true. 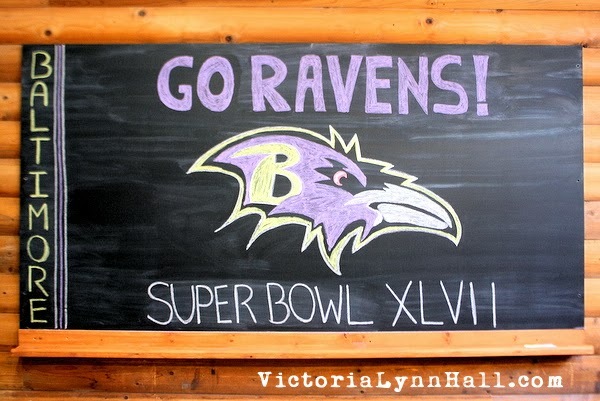 I'm convinced this Baltimore Ravens chalkboard mural somehow contributed to their Super Bowl win. 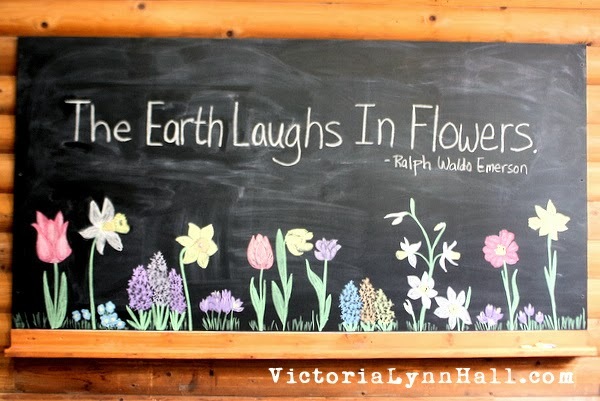 This spring flower themed chalkboard mural lasted through the spring and summer gardening seasons. And then I took a little break before getting to the autumn chalkboard mural at the top of this post. Shame on that drawing teacher! 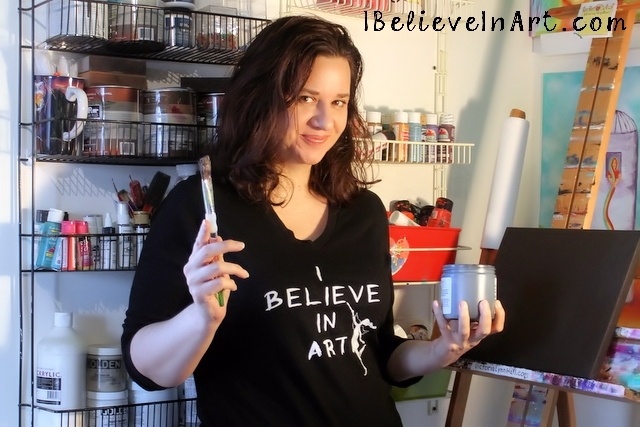 So happy for you that your creative spirit emerged & has thrived despite that experience. 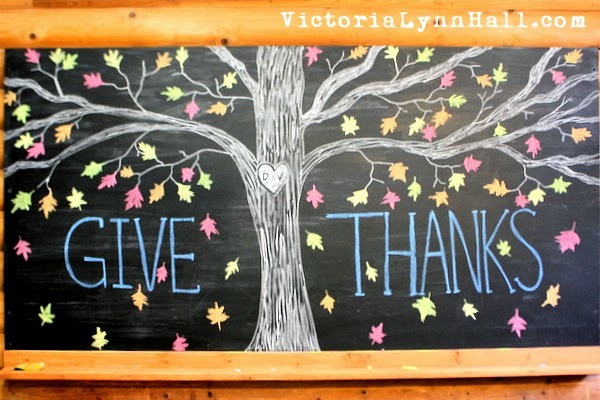 Your chalkboard art is so playful & fun! These are all. so. good! 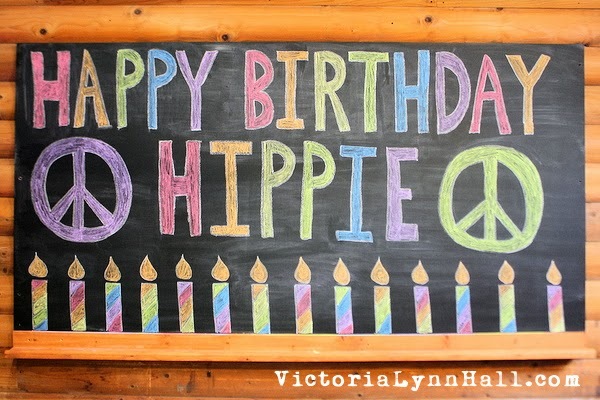 Makes me want a chalkboard! 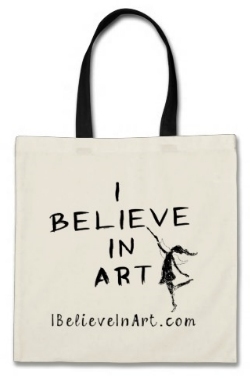 So love your whimsy! I think I need to unleash my whimsy....thanks for always being encouraging! 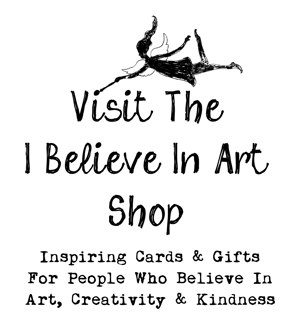 New Etsy Shop & A Giveaway!